For two days we picked greengauges. After a week of relaxing it was hard to gain focus to get up early and pick. 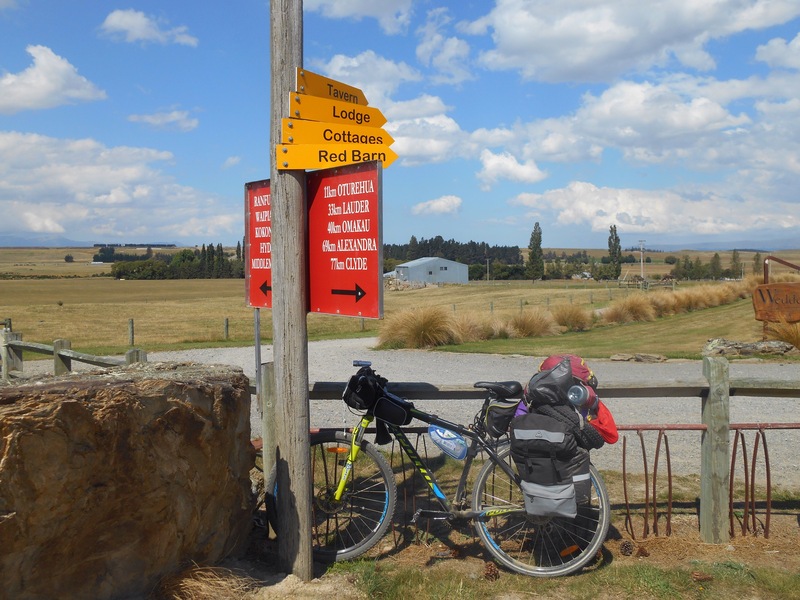 After an incredibly short season, I packed up my ever accumulating luggage to start the Otago rail trail the next day, not before realising just how often I had been frequenting my favourite coffee shop as they offered me a job so I could stay. 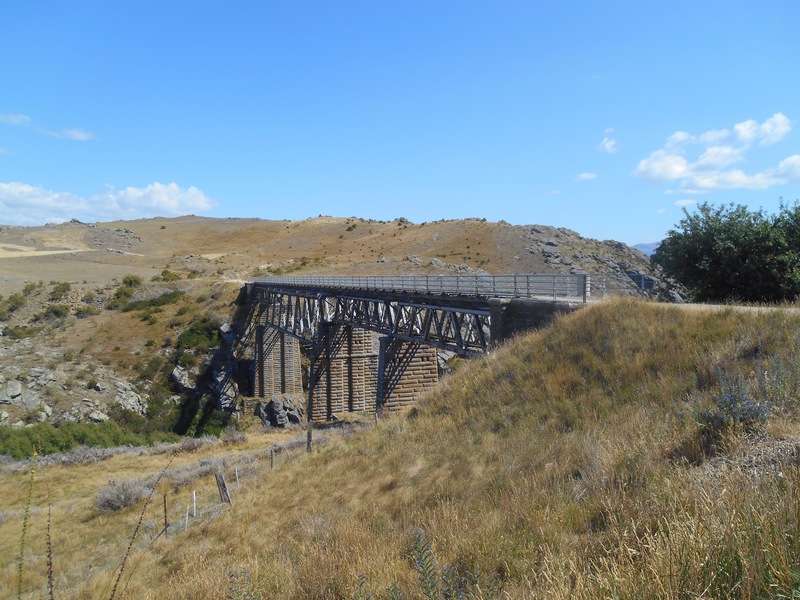 Bidding a fond farewell to Cromwell, I followed the highway 26km to Clyde where after a coffee in the sun, I started the trail which would follow the line of the old train 152km to Middlemarch. 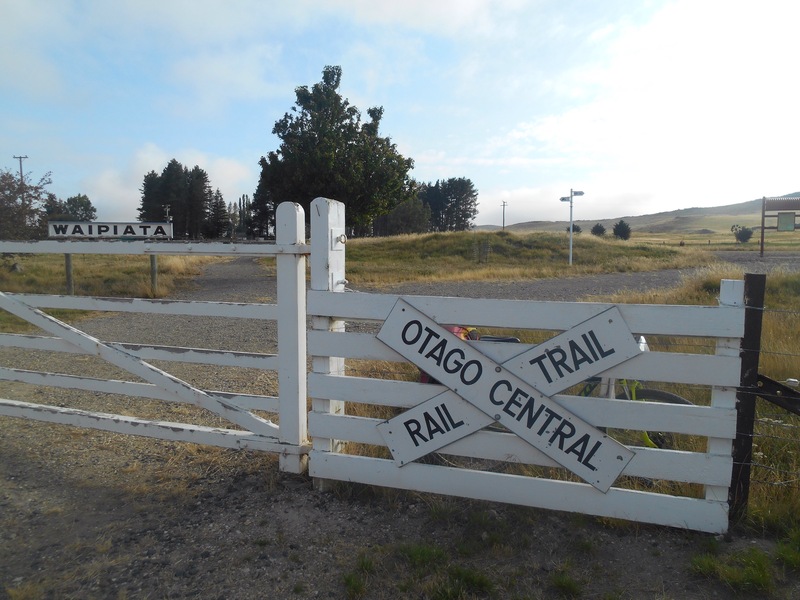 Once the route to transport gold from the Otago basin to Dunedin, the trail meanders alongside Alexandra to Omakau where I stopped 35km later for my first night. 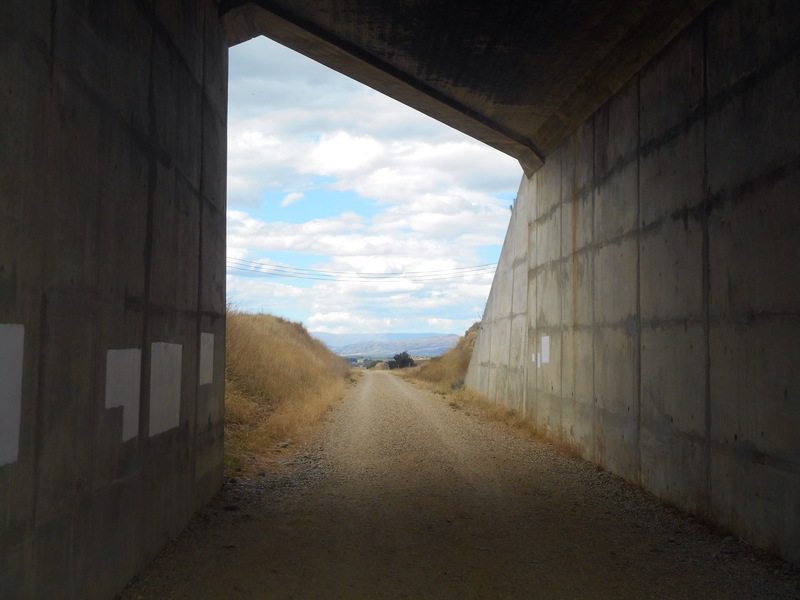 The trail was New Zealand’s first and most famous cycle trail and little red granger sheds made from corrugated iron perforate the trail, once a shed for those maintaining the track, now providing much sought after shade and a little window into what life would have been like, both constructing and riding the railway. 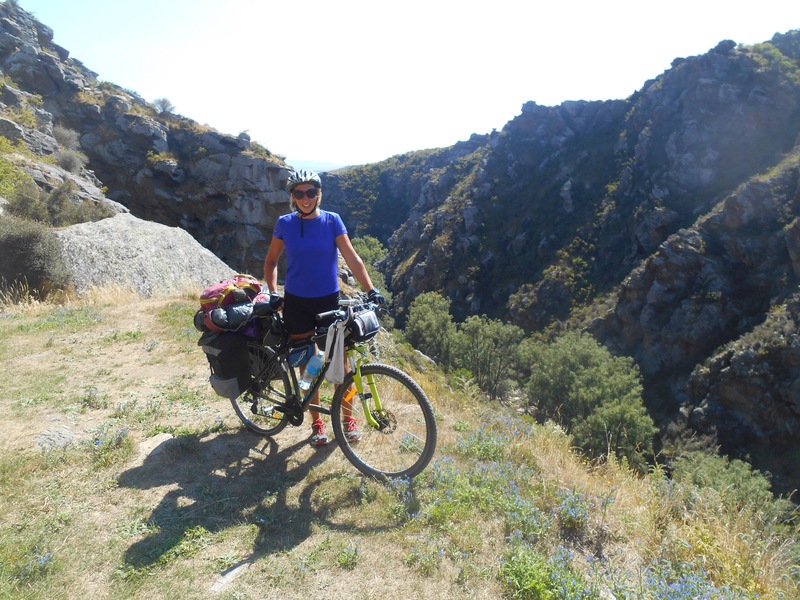 My first day back on the bike in a good while, I was relieved to have my tent up, my dinner ready and be able to put my feet up for the evening and share stories and high points with other cyclists. I was awoken by the sun beating through my tent, so packed up quickly and cycled to Lauder for breakfast. 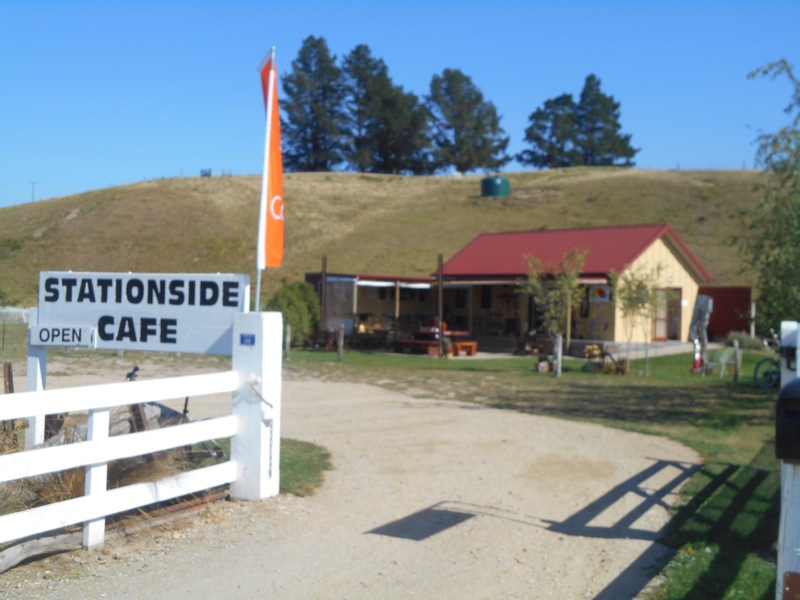 The station side cafe was filled with cyclists ready to start their day, the sunny spot trackside supplying hearty breakfasts. 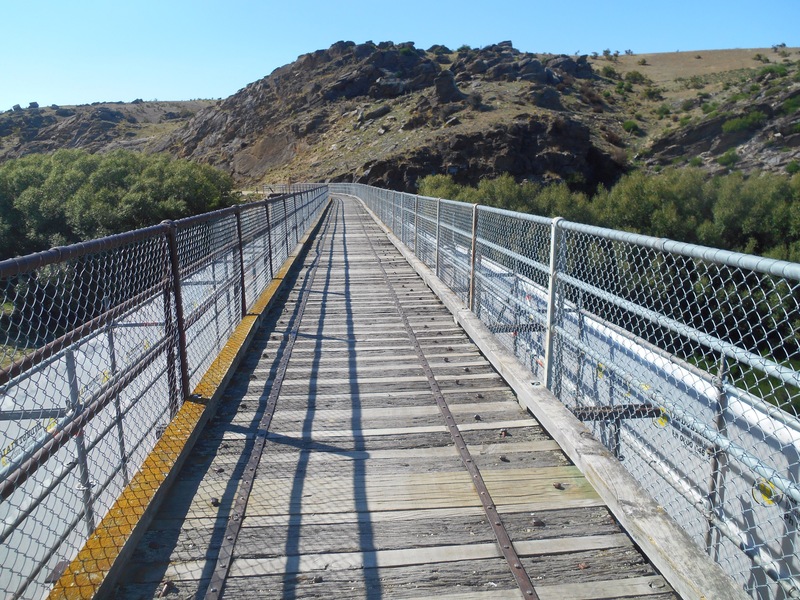 From here the trail traversed the Poolburn gorge which was absolutely stunning. 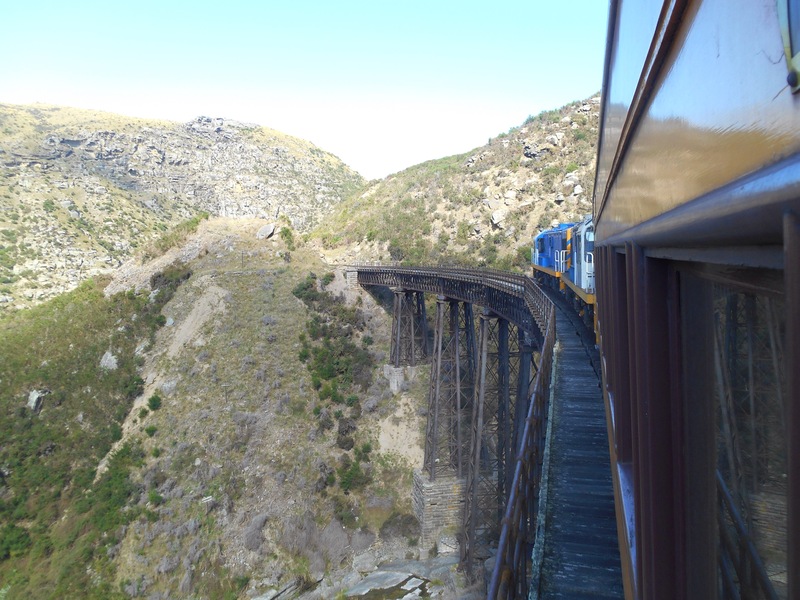 The rocks dropped away steeply to the side and the track cut through the rock. 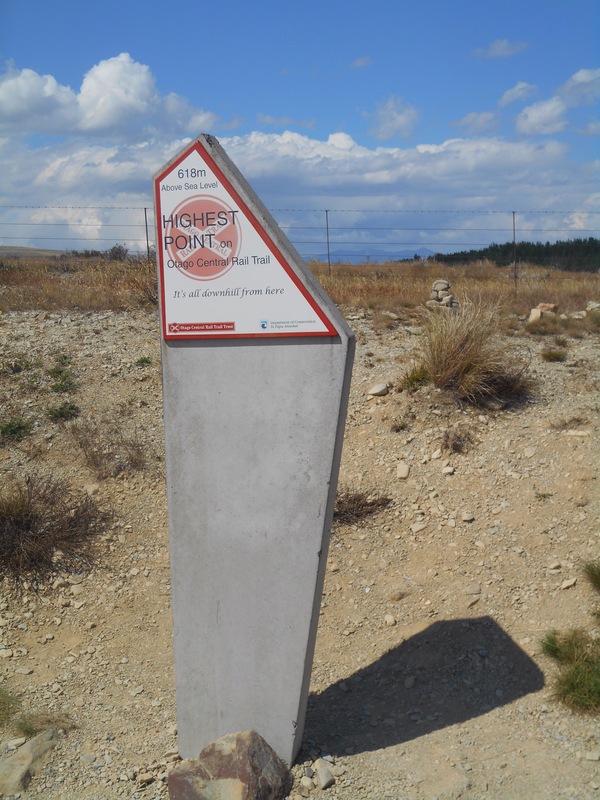 Abandoning the bike, you could walk down to the camp where workers would have stayed whilst constructing the rail, remnants of their exposed camp remaining to mark their toil and achievement. 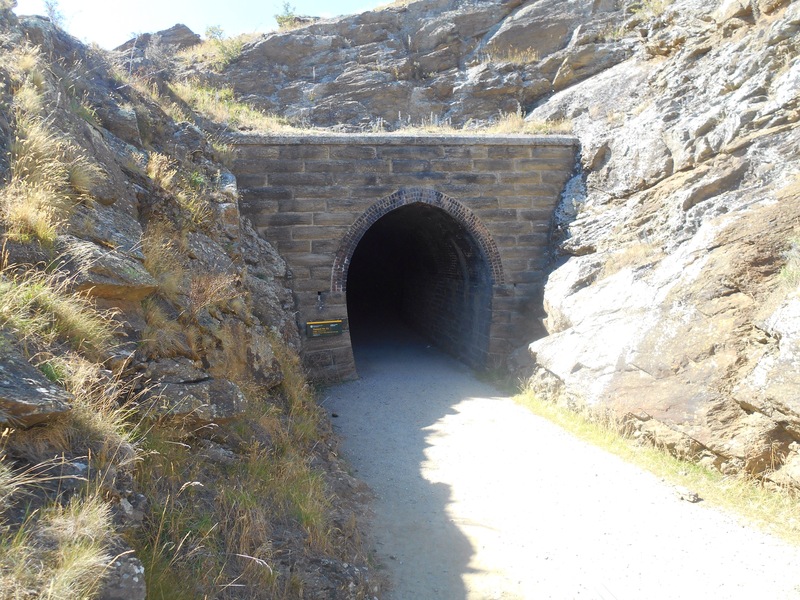 The trail cuts through two tunnels in quick succession, 230 metres then 202 metres of dark. It is oddly disorientating passing through, even dismounted, towards the hole of sunlight at the end. 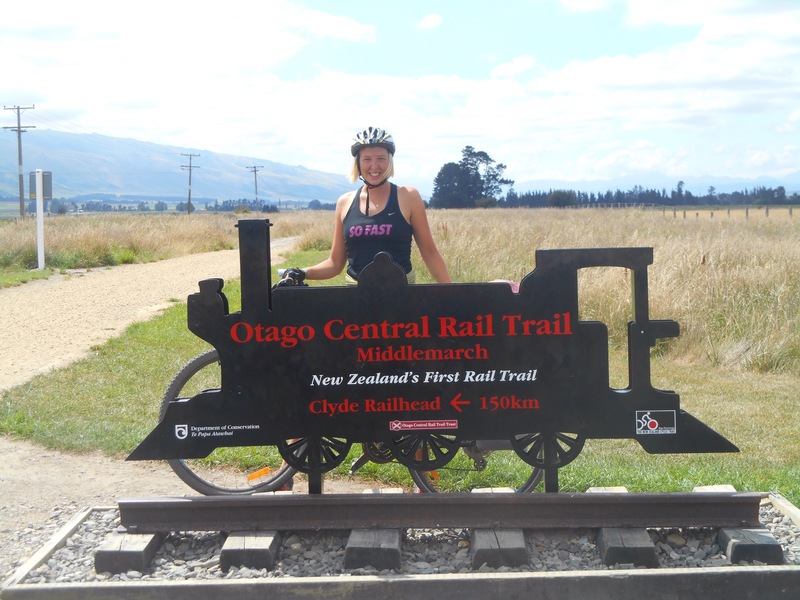 Next, in the township of Oturehua I enjoyed a well deserved lunch, sharing stories with some fellow trail riders. 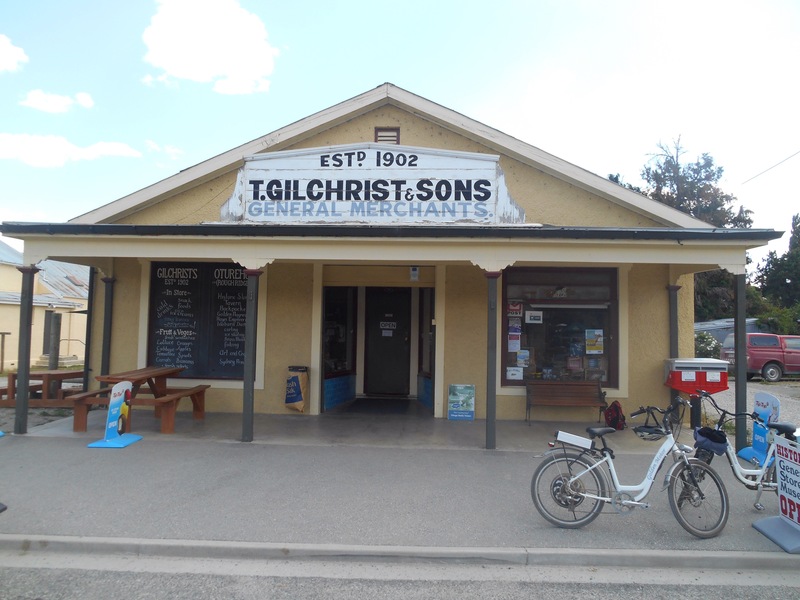 Despite a beautifully sunny pub garden, this small township also boasts New Zealand’s oldest general store, Gilchrists. 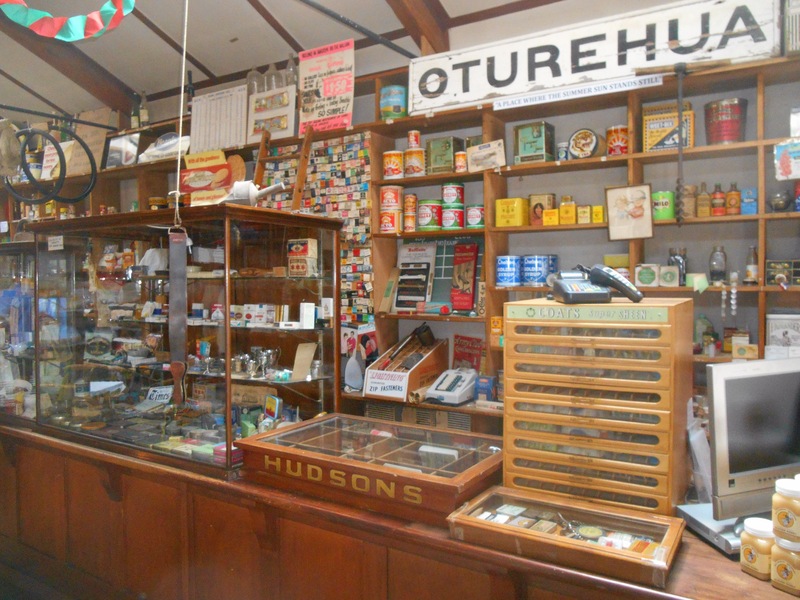 It was fun to see the old set up of wooden counter and vintage displays, although its novelty factor must lead to its business as it was overpriced. On the trail I passed a woman who had managed to lose her husband despite it being one long trail that even I was managing to keep direction on. 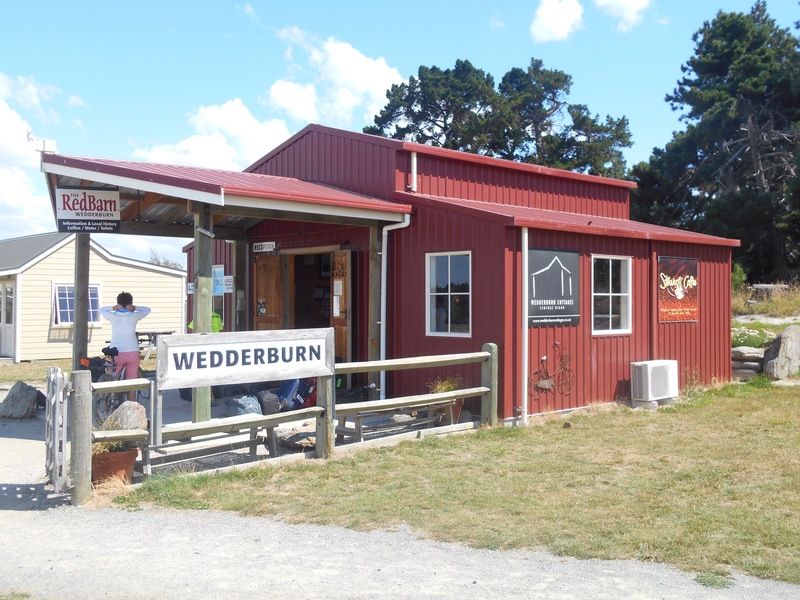 Then the ever changing scenery began to climb to the highest part of the trail just before Wedderburn, at 618 metres above sea level. 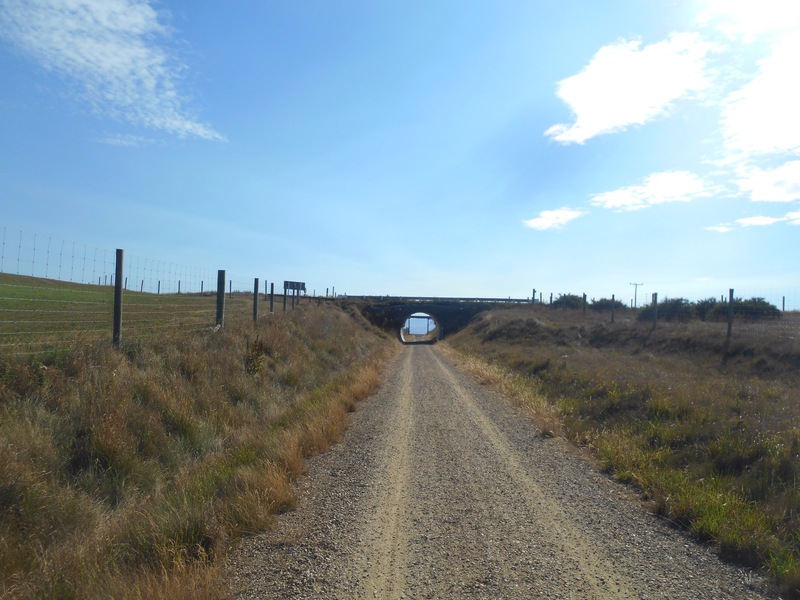 It was a gradual climb but in the exposed heat of the afternoon sun, it was nice to turn the wheels downhill and towards Ranfurly where I would stop the night. 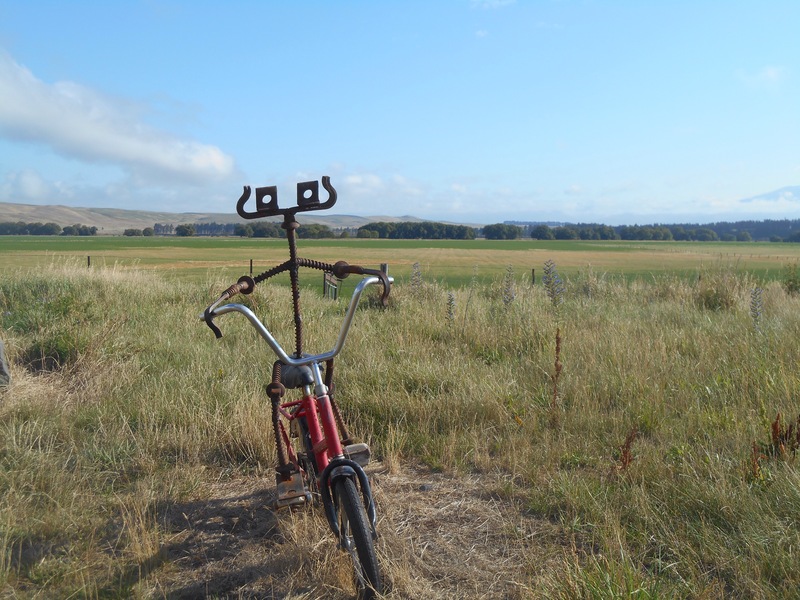 The horizon opened out to “big sky country” which had wide open farmland and not a person in site. 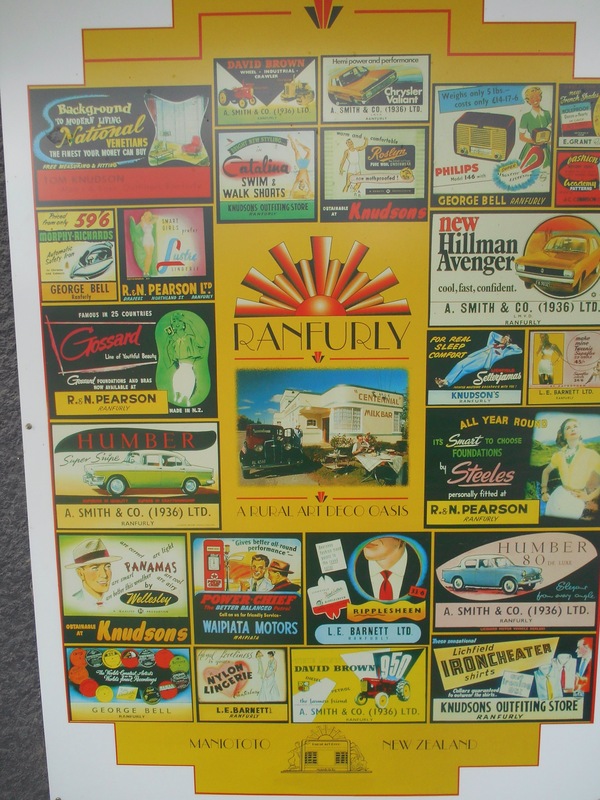 Ranfurly was an Art Deco town, springing up around the rail when it passed through. 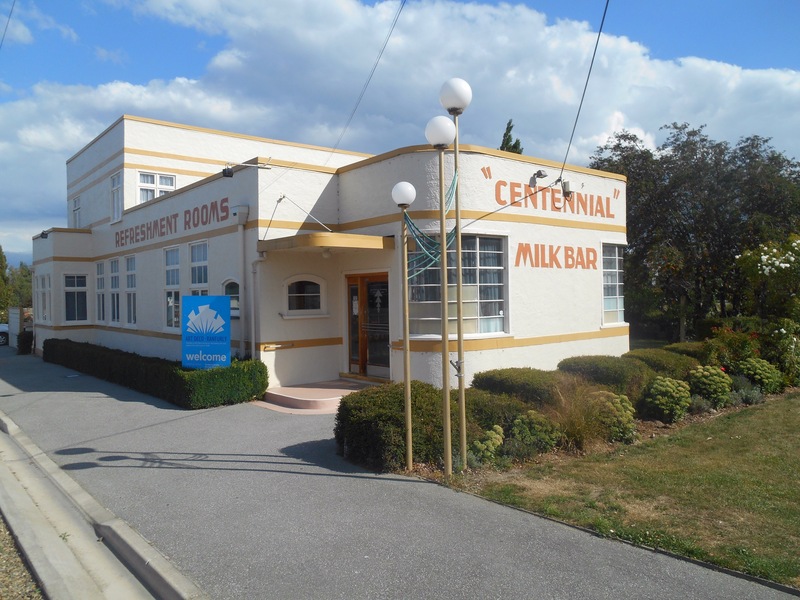 Mrs Higgins once provided hot lunches for 1 shilling and 6 pence on the half hour stopover here, and later centennials milk bar provided the stopover refreshments for commuters. 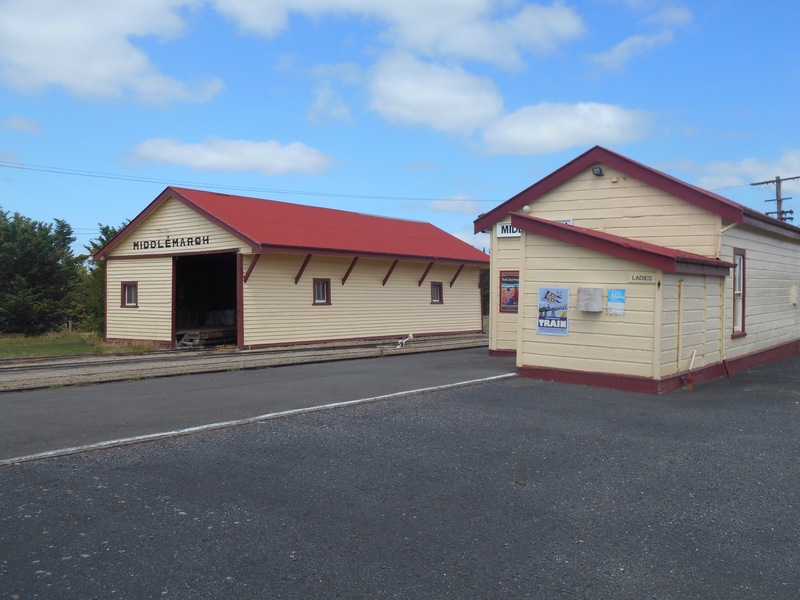 I sat in a model train carriage to watch film footage of the line through the years, slowly connecting to Cromwell in the late 1800’s and shutting in parts in late 1900’s, once again cutting off this part of the country. 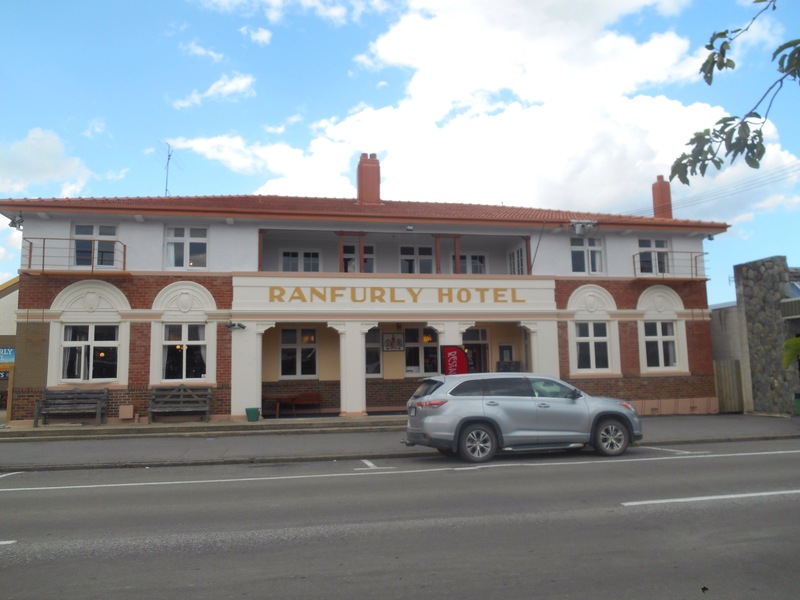 I made a New Zealand error in bypassing the Ranfurly cafe thinking I would get breakfast 8km further on in Waipiate, however the little station town was deserted, the pub far from open. I pushed on to Hyde, 25kms further. On the way, encountering a bump, my heavy luggage caused the rack to collapse. I had my gear off, the wrench out and about half an hour later I was good to go again, feeling concerned, but also proud of my makeshift skills. At Hyde I fuelled up, breakfast, coffee and lunch break rolled into one. Unfortunately a significant lack of vegetarian food meant I was forced back into the old ways of cake! 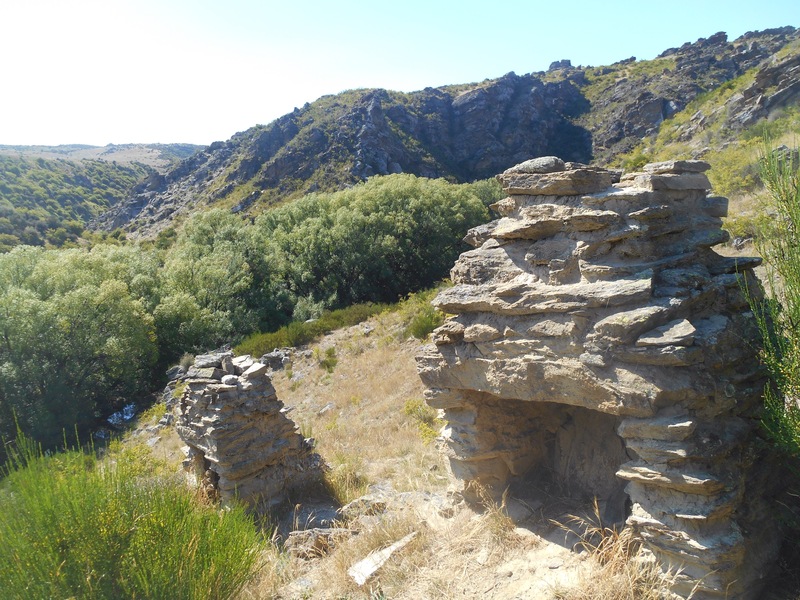 The last stretch of the trail led through the Upper Taieri Gorge, through the Rock and Pillar range of mountains and into Middlemarch. 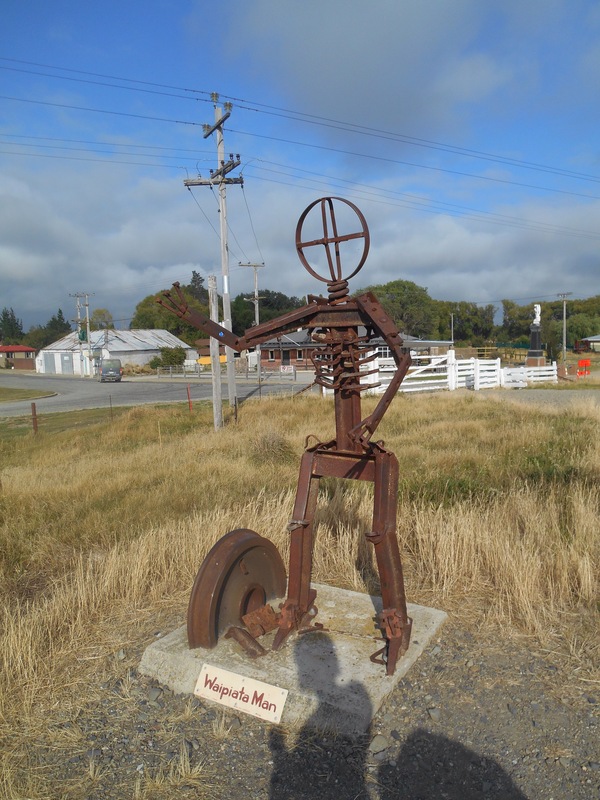 The town which greeted me was small, and after the finale photo, it was still early to ponder whether to press on. 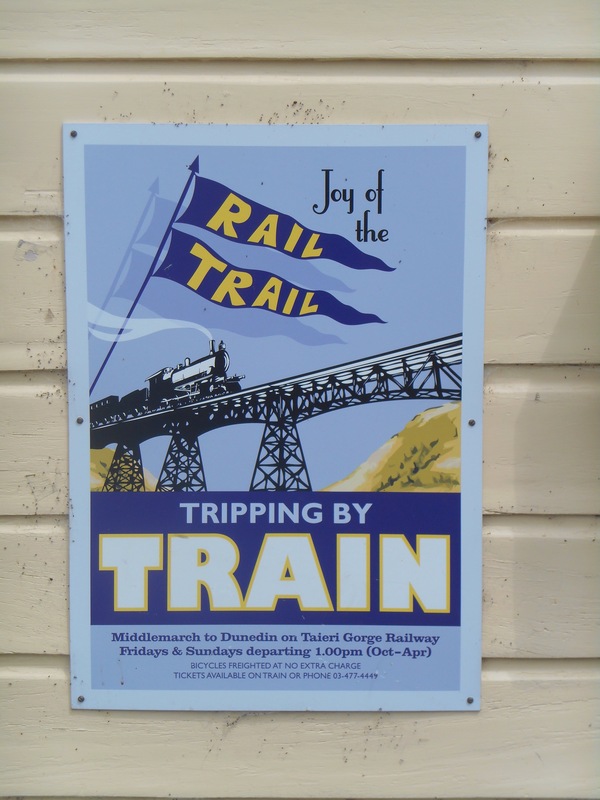 Deciding there was nowhere to rest my head between Middlemarch and Dunedin, I found the train was leaving shortly, and having enjoyed the trail so much, it seemed an apt way to end the journey. 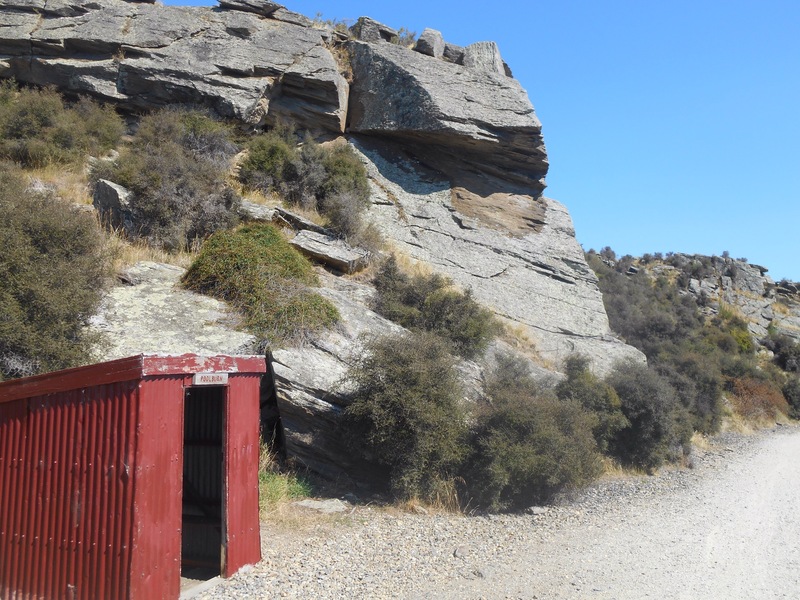 I picked up the train from Pukerangi, travelling by shuttle through bare countryside filled with stacks of rock, again a vast change of landscape in a short space. 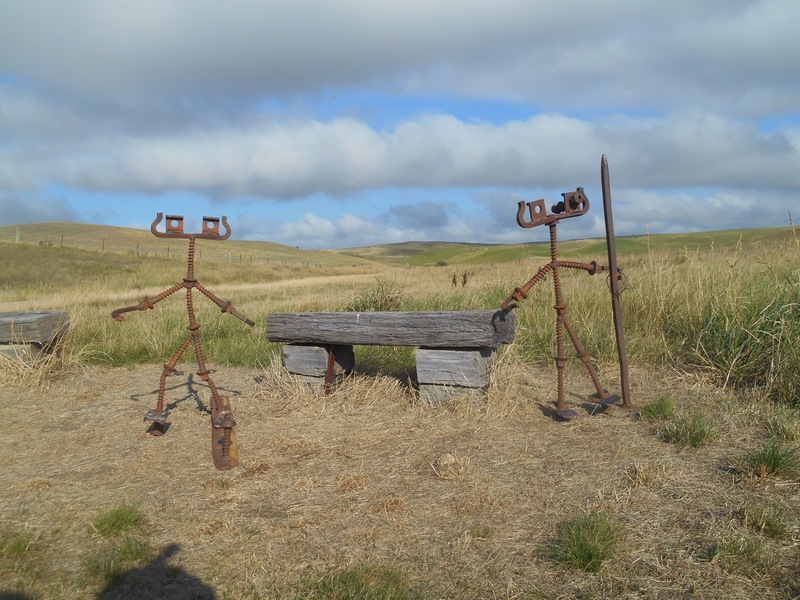 The train was an old chain of carriages, connected shakily with gaps to stand outside on the carriage behind little iron gates. I enjoyed a beer onboard, of course the local, Speights, before taking to the outside to enjoy the warm breeze and the clatter along the rails. 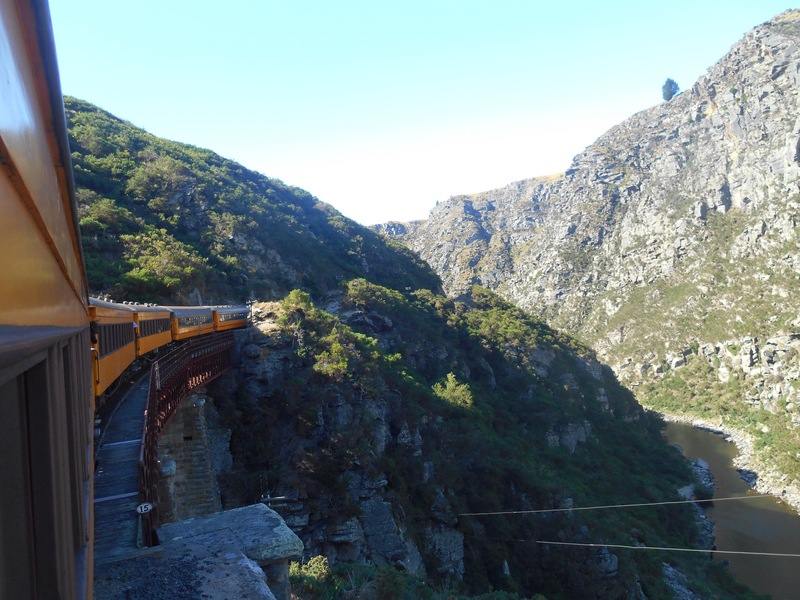 The journey exceeded all expectations as we snaked through the gorge, across dramatic bridges, viaducts and through 10 tunnels which greatly excited the couple I had ended my journey with. Inside the carriages, the period pieces made the journey feel like a mark in time. 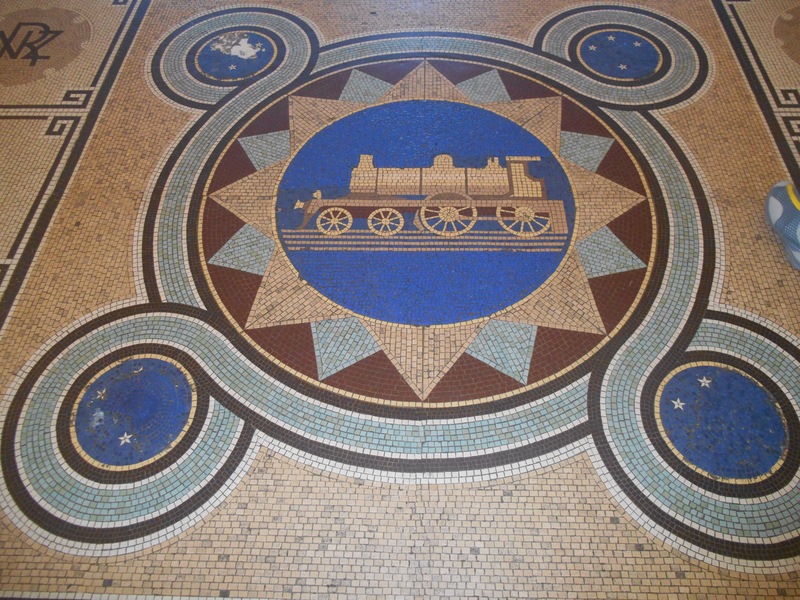 Dunedin’s railway station is an incredible building, I have heard described as a gingerbread castle. 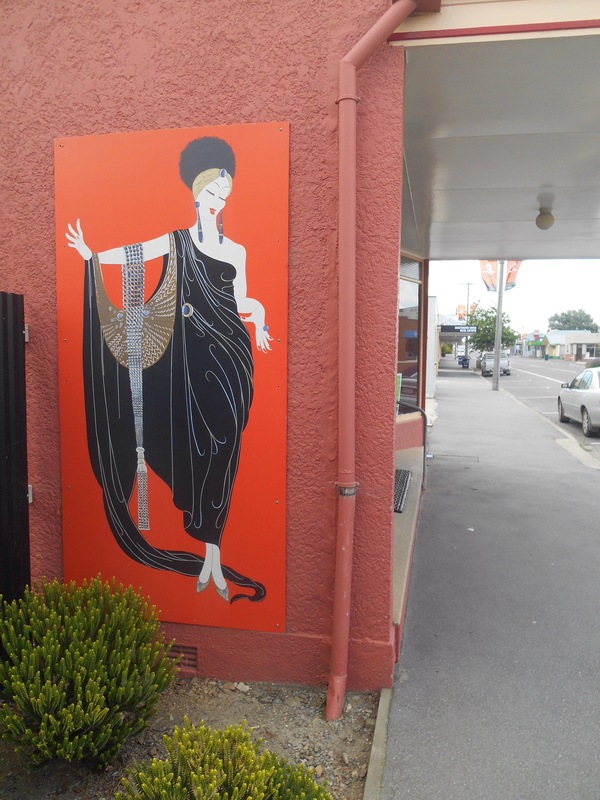 It’s ornate design is topped off by manicured lawns out front and is a welcoming scene to the city. 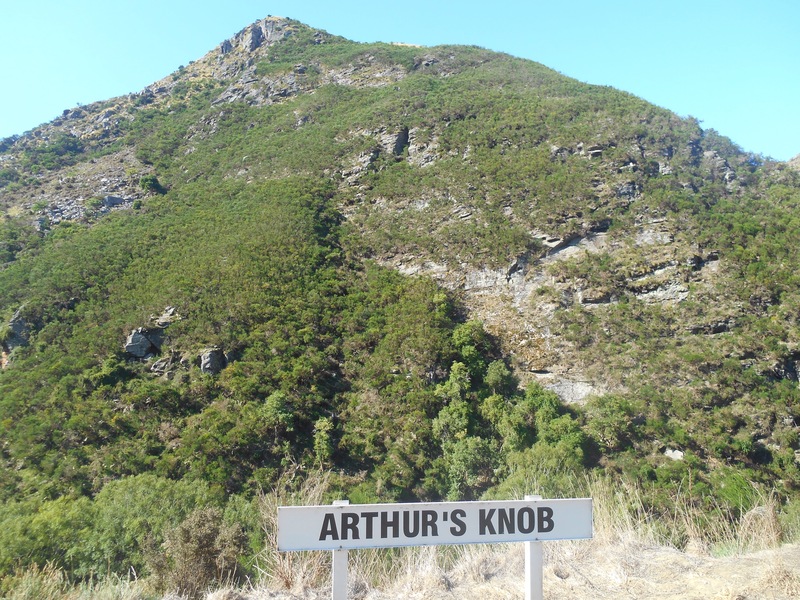 My hastily organised hostel was a converted Manor House up one of Dunedin’s many hills. 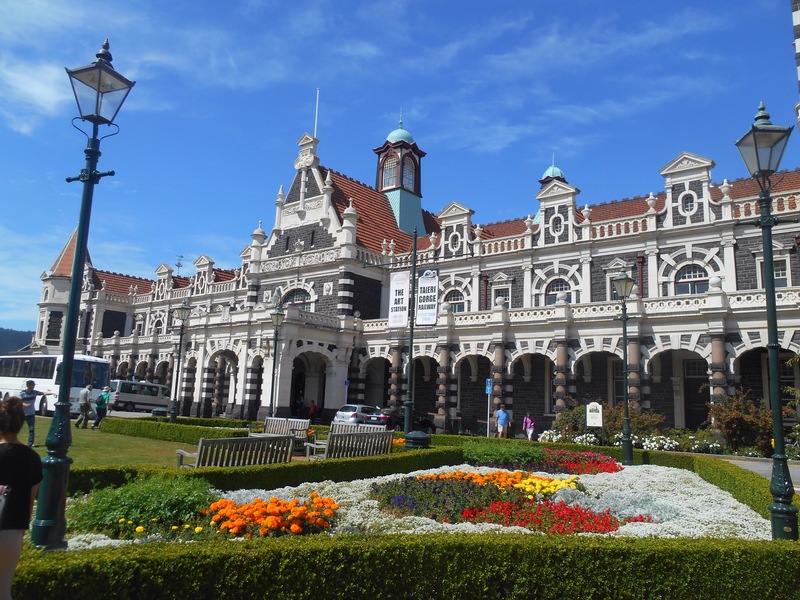 As soon as I caught sight of bed, the sun and adventures of the day caught up with me, and my Saturday night in Dunedin was far from living it up in the Octagon! Exploring was for the morning light!